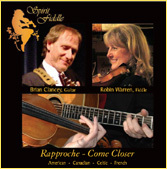 Rapproche - Come Closer is the 5th in the collection of Spirit Fiddle recordings. It includes vintage Spirit Fiddle material, waltzes, musette, a bit of Texas swing, and Canadian jigs and reels. But now there is something new: a Celtic flavor. Both Irish and Scottish tunes join the mix, to create a truly worldly blend of beautiful fiddle and guitar sounds. The duo of fiddler Robin Warren and guitarist Brian Clancey is joined on this album by David Goodhue on acoustic bass. Paddy League's bodhran is heard on a few of the tunes. Kyle Loring is an original tune, a reel, written by Robin Warren while sitting in the Tampa Airport in February of 2007. The fiddle did not get to go on the trip, so the tune was born on music composition paper. The album begins with a medley of fairly well-known Irish tunes: Road to Lisdon Varna, Drowsy Maggie, and Kitty's Ramble. Calliope House, Cowboy Jig, and Old Sparky were popularized by Scottish Fiddle Champion Alisdair Fraser. 40 Years Ago is a sophisticated southern waltz, all played in double stops. Waltz of Joyce Montgomery is written by Canada's great contemporary fiddle composer Calvin Vollrath, as is Jerry's Jig. Our love of the musette tradition is represented on this album by 5 tunes: Fétiche, Reproche, Amor del Bajo Corrales, Rêve Bohémien, and the irresistible Valse Chinoise. Finally, our medley of the Irish ballad Star of the County Down with the Old Rugged Cross has been much requested at funerals and memorials. Several of the tunes include things that we cannot perform live: double fiddle, guitar melodies, bodhran drumming, gong, and bass. A note about the album title: Someone initially told us that the French tune name Reproche (the helpful fan heard the name as Rapproche) translates as "come closer". What a lovely name, we thought! We decided to name the album after the tune. Unfortunately, when we came to the licensing process, we learned that Reproche means "reproach". How embarrassing. We stuck with Rapproche for the album title, and list the tune as it should be. From graphics to proofreading to mastering, this confused everyone involved in the production of the album.